Today, the wonderful Al is sharing with us her mini quilt inspired by the song, "What Child is This?" She and her sisters, Jo and Scary (aka SarahLynn), have some great projects at their blog, Shaffer Sisters. 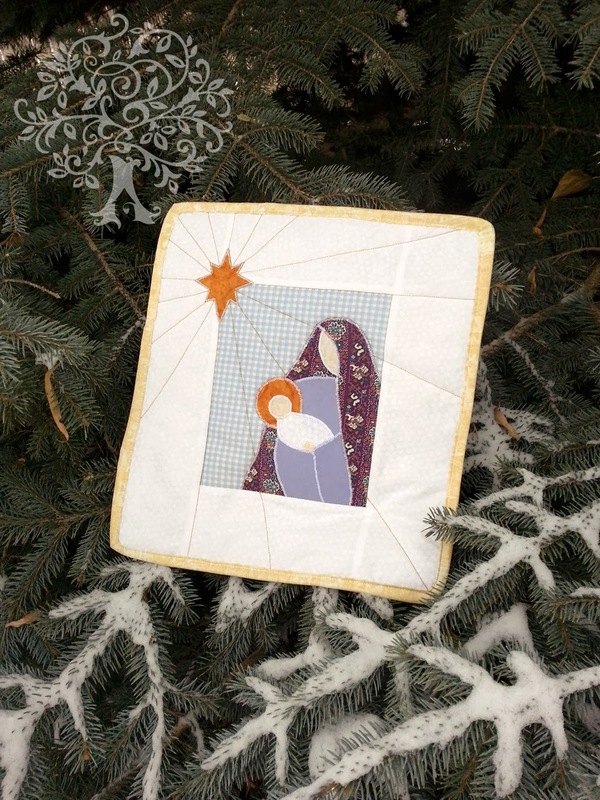 One of their projects I'm excited to try is the Minky Crib Sheet. (How amazingly comfortable does that sound?!) And they do a lot of sewing for girls (I love this cute dress) and for boys (like this awesome shirt). You should definitely go check out their blog! But first, the "What Child is This?" mini quilt. On to you, Al. 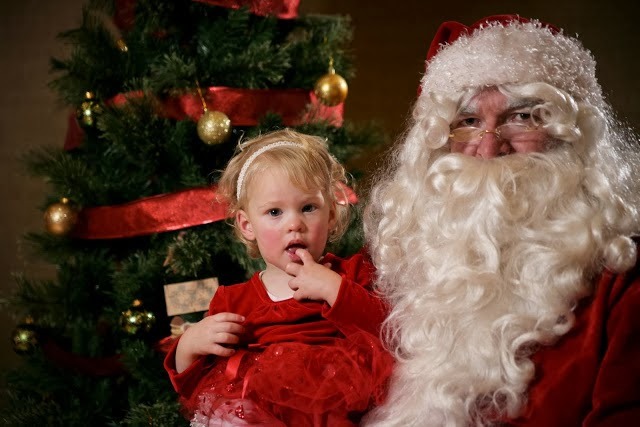 This was taken at a church Christmas party when Ty was 18 months old. I love Christmas. I treasure the peace, hope, and love that I feel when I think about the true meaning of the season. Too often it seems like the Christ in Christmas is lost to bright flashing lights and an excessive focus on Santa and the entitlement of gifts. I love my Lord and Savior, Jesus Christ, and this season (as with years past) it is my goal to give something that keeps the focus on my Redeemer. The King of Kings was born into the most humble of circumstances, but that didn't make Him less. His birth was marked by the fanfare of angels, the brightest star in the sky, and the company of humble shepherds and faithful Wise-men from afar. From a young, pure, and loving mother He was born. 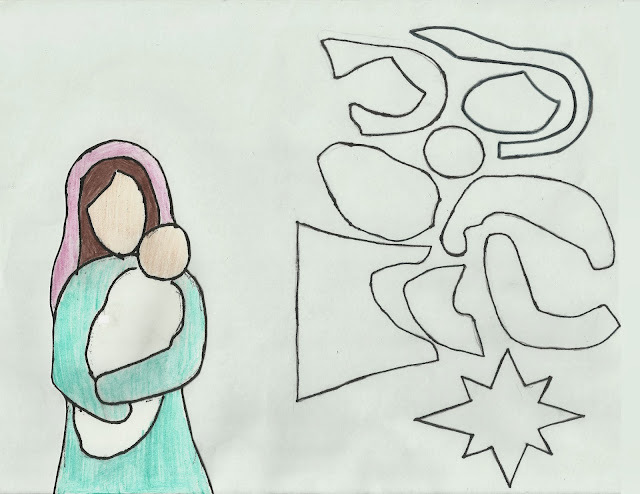 I'm sure that Mary, just like all new mothers, felt an overwhelming love of this gift straight from heaven, but also an uncertainty that she could be the best for of someone so precious and perfect. This story is portrayed in the hymn of "What Child is This?" It is one of my favorite Christmas songs. One day while thrift store shopping I found "Quilt a Colorful Christmas" (contains 39 projects) and it cost only $2. You should probably know that I love quilts so getting it was a no brainer. One of my favorites from the book was the Mother and Child project which I decided to share with you today. This was such a fast and easy project. 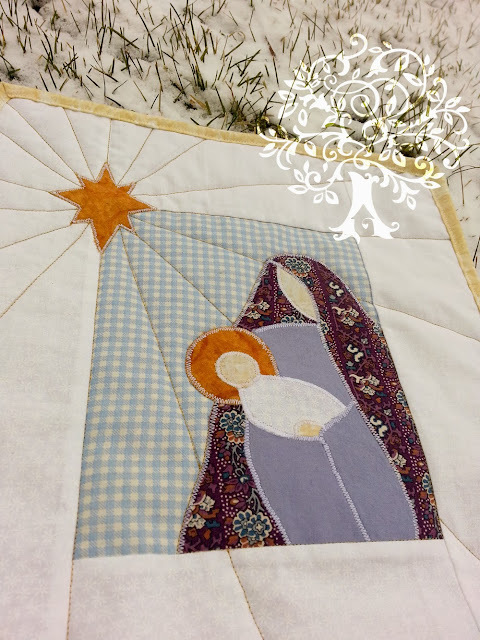 I thought it would entail paper piecing or something a little more complicated, but it was simply just fabric, sew-able heat-n-bond (they recommended fusible web, but I had to make due with what I had), stitching on top of the applique, and then putting it all together. Sadly I can't give this pattern to you since it's not my design, but you can do something similar to this by just sketching it out. Then add 1/8-1/4" (on your sketch with a dotted line) to the pieces that lay underneath the pieces on top (so you don't have any unwanted dead space, but you will be able to trace out your pattern next). 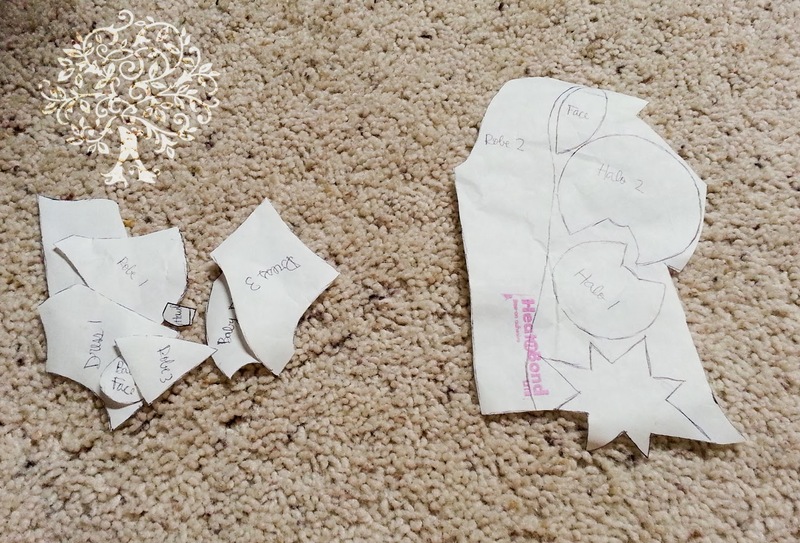 Then you can go through and trace out each little pattern pieces onto printer paper. And wala you have your own pattern. Since I don't want you to miss out if you want to do something like this and feel like you lack the artistic ability necessary, I came up with my own design using the instructions above. 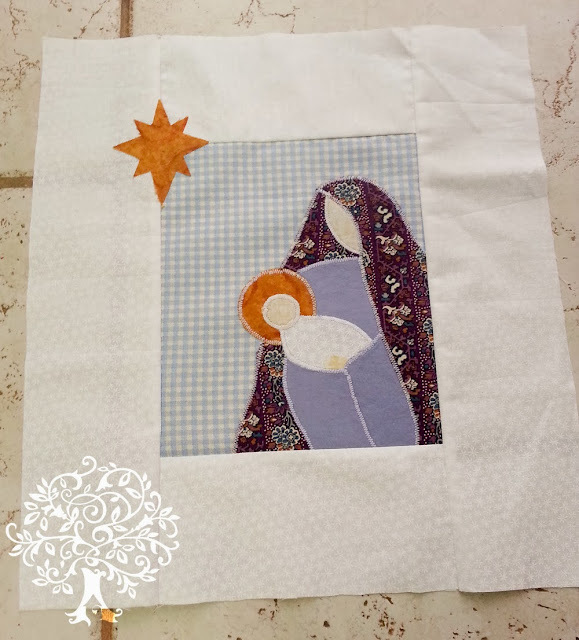 I am sharing the pattern with you and tomorrow you can come over to my blog and see the finished project and share yours if you decided to make one as well. (1) blue background fabric 8" x 6 3/4"
*When sewing use 1/4" seam allowance. After printing or designing your pattern pieces place then fusible webbing or sew-able heat-n-bond above the pattern (paper side up) making sure you trace all the pattern pieces. After that it's just a matter of cutting out the adhesive pattern pieces and ironing them to your scraps of fabric, cutting them out of the scraps and removing the backing paper. To put it together you can look at your original picture for a placement guide and place it on the blue background. Don't iron until you are absolutely ready. When I did it, I just did a little at a time (starting at the bottom and making my way up) because I wanted to be able to adjust if it shifted. Once it's all ironed you can stitch around the edge of the applique with a small zigzag stitch in a clear or neutral thread so that the design will stay. After that it's a matter of adding the border (top and bottom first then sides) and putting it all together like a mini quilt. There's a little extra length on the side pieces (1/4") that you can trim down and square off when you are done. All that will be left is to quilt (what design/method you choose) and bind. 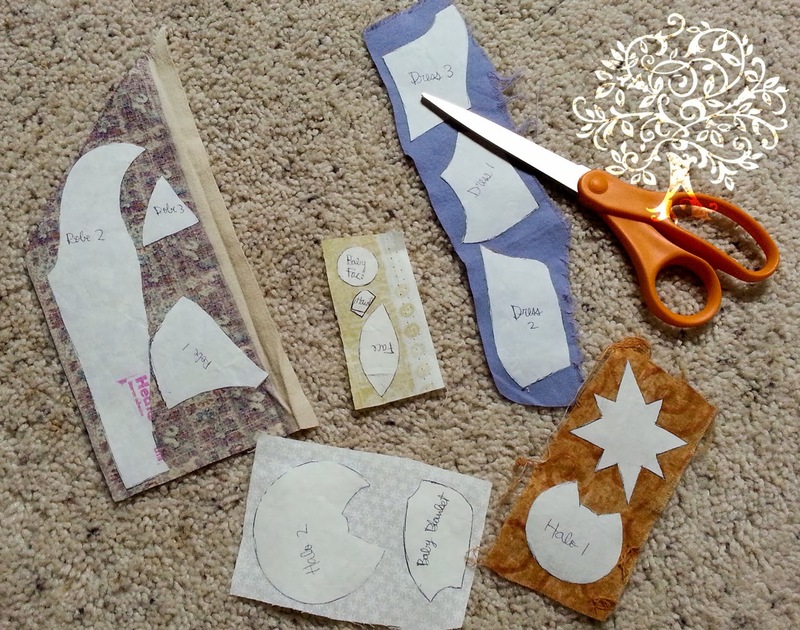 If you don't know how to do binding you could read this tutorial on binding. Thanks so much for letting me share my love for the Lord this Christmas season. 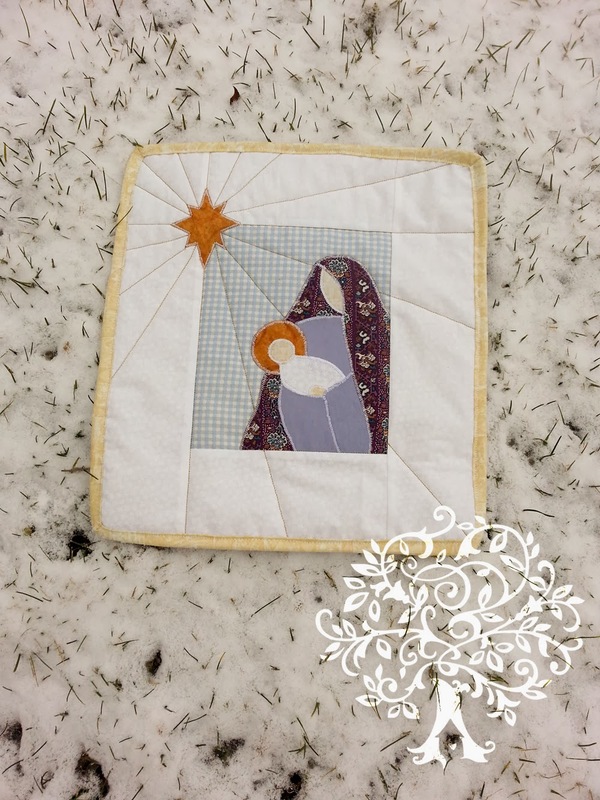 Be sure to check out the other posts as we Sew a Song of Christmas!